I had sent my money into Bananafish the last week of February all set to take my third trip to Copper Canyon. A week before the trip, Sandy called saying that their regular bartender couldn't work and since I was so good at helping out she wondered if I would like to bar tend. In return she would send me back my check and the trip would be free. I could keep any tips I made so we had a deal. A week later I drove down to the AA Parking lot in Calexico, walked across into Mexico and taxied to the Hotel Lucerna to check into my room. It was such a nice spring afternoon I went down and sat out by the pool where I met some of my future customers. They were all very nice people and I thought to myself that this was going to be fun. 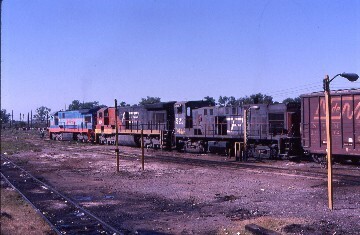 3/25/1991 The next morning we went down to the train station, passed through Customs and I photographed the train. I went to my room, unpacked my personal liquor then went to the lounge car to set up for business. The bar was a desk so the bottom drawer is my personal liquor cabinet. I went to the kitchen area to get some hot water for coffee and tea then I was ready for business. I have a window I can open but decided against it this morning due to the sandiness of the Altar Desert. One of the Custom officials came up to me saying that three passengers did not sign their Tourist Permits and said we cannot leave Mexicali until either those people sign them or I sign them. To save time, I signed them and the custom agent went happily on his way. 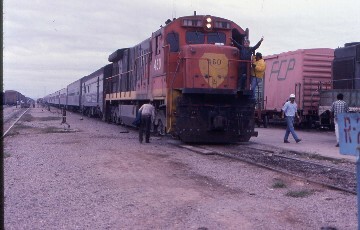 The train pulled out of Mexicali and soon people began to filter in. My first customer, a nice gentleman about fifty, let us call him Bob, sat down on the coach and asked for a beer giving me his name so I could check him off. That is how we kept track of everybody on the trip. The sheet was divided into columns of coffee, tea, soft drinks, beer and mixed drinks with everyone's name on this tour printed on it. I just put a check in the right column anytime someone orders anything. I opened up the ice box behind me and asked Bob what we wanted, Tecate or Corona? He said, "Tecate" so I pull one out, wiped the top off and then hand it to him with a smile. The coffee crowd arrived so I pour the hot water and let them mix it anyway they choose since they know how they like it. By the time the coffee rush was over, we were passing the Geo thermal fields I got my first break of the day pouring myself one and getting Bob another. We got talking, getting to know each other and he wants to know more about this journey he is on. I inform him what a normal trip is liked. He asked "Is it always like this?" I just smiled and responded with, "Let me tell you about the last trip I was on when.........." and when I was done with the "Water, Water, Everywhere" story we had past Delta and were fast approaching the Colorado River. The river is at the lowest level I have yet to see it which would make sense since the Spring runoff hasn't reached this far south yet with all of the dams upstream. 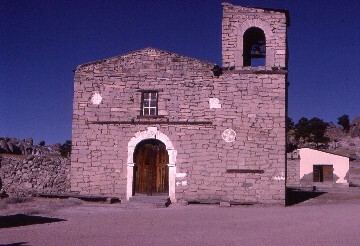 The train made its stop at Coahuila and headed out into the Altar Desert. Within minutes we were entering the dusty world of the Altar as the beer crowd arrived as all of that dust must have made them all thirsty. Bob beats me to the punch and had another one as I did the same. Sitting here watching the Altar is a very different way of crossing it. The interior of the car got really hazy cutting down the available light inside. I might have offered this thought before, but the Altar Desert is the dustiest place I have ever been! I watched for The Crosses as we passed them and I realized that this was the first time I had been sitting on the train past them in daylight but I shot a picture anyway. I made my first Margarita of the trip and the woman who ordered it announced just how great it was so I had a Margarita rush now to deal with along with another for Bob before we arrived at Puerto Penasco where I got to go outside and stretch my legs in the warm March sun. Sandy came up to me telling me I was doing a great job and several other passengers agreed with her. It is funny being a bartender instead of a drinker as I am learning a valuable lesson on the subject. We left Puerto Penasco and it became a slower pace of beer and Margaritas until out of the blue a gentleman ordered a rum and coke. He took a sip and said, "Perfect!" He sat next to Bob who had another and over the rest of the afternoon I had my two best customers so far sitting right in front of me. With his second rum and coke in hand within five minutes, I poured myself another one and carried on a good conversation with these two passengers until Caborca where as usual I detrained to photograph the passage of SBC number one by us. After another good stretching session, I returned to my post and within minutes Sandy came to give me a break but not before I took good care of my two best customers. I went to my room, put on my headphones and watched the Sonora countryside passing outside my window. I then went to the rear platform to watch the kilometer posts get higher as we headed to Benjamin Hill. I returned back to work, got another round for my regulars and myself, opened my window and did a fairly good business while watching the rest of the countryside pass by before we arrived at Benjamin Hill. Since there was plenty of light since this trip is three months later than the other two trips I got off for some pictures while they combined our train with the one from Nogales. Heading south down the Pacifico's mainline at a nice rate of speed, dinner was served and I was passing out the drinks to go along with the meals. I ate mine in between serving everyone and then poured after dinner drinks until Hermosillo where I detrained for the first time. I poured my regulars another round when Sandy arrived saying she will work the rest of the night and told me to go enjoy the rest of the evening. I poured one for me, said my good nights to everyone with all of my customers responding then went to the rear platform to watch the stars and the tracks fade from our marker lights. It was quite a nice sight. I finished up my drink, made up my room and went to bed after experiencing my first day ever as a bartender. 3/26/1991 The next morning, I woke up finding myself in Sufragio as normal and checked with Sandy when she wanted me to start. She noticed my camera and said, "Why not go and get your pictures now since the hot water is not ready yet. Just be back in thirty minutes." "That works for me!" I said so off I went to the engine facility and a walk around the yard before I started day two of my duties. It is time for the coffee club as people woke up in Sinaloa and came in for breakfast. I like my bagels plain and my tea with a lot of sugar. This morning I made a few screwdrivers for a few passengers as well as some for me. I do need my vitamin "C". An FCP freight passed south while we waited. The First Class train CHP 3 passed right outside my window on its way to the station. Today we were traveling on the Second Class train CHP 7 which runs about an hour behind number three so everyone was served before we left and had signed the liability release to ride in the open car. Train number seven pulled into Sufragio, got our cars before moving forward to do its station work. This was the fastest that we had been interchanged yet. I opened my window as we sailed up the CHP mainline. It sure is different being in here at the bar than out in the open car as I had been on all of my other two trips. It was a whole different view and perspective of the Sinaloa countryside from here looking out my window. Bob returned to his normal seat and I greeted him like Norm on Cheers with "Bob!" I reached back, opened the ice box pulling out a Tecate and said "Good morning" with a smile. He took his beer and I made myself another screwdriver and the conversation started. "How did you sleep? Where are we?" from Bob and "Are you enjoying the trip so far?" from me. He said that he was having the time of his life and I wondered just what kind of life Bob had so our conversation took a more personal tone. El Fuerte came and the train made a brief stop after which Mr Rum and Coke arrived making his first appearance of the morning and did not surprise me with what he ordered. It was a bright sunny morning outside, the complete opposite of how it was just three months ago. What a difference. The lounge was filling up again as members of the coffee club returned for seconds and thirds. People keep telling me that they liked the fact that I let them make their own coffee and keep telling me I would be tipped well. I glimpsed the cement plant out of the opposite side of the train after which I poured a second round for my regulars so they are taken care of then I fixed myself one last screwdriver. 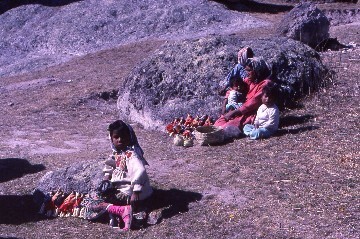 The station stop of Loreto was our next stop and the children came right below my window begging for anything that they could get. Finally we slowly pulled away with them chasing us until they all lost the race with the train. Sandy came in and decided that I should move my operation out into the open car but asked me if I thought that was a good idea. I said I would take the stuff out as we were in the Descanso Tunnel and I would stay out there until the tunnels after Temoris. Sandy said, "That sounds good and I will bring you out anything that you need. Let's make a container of Margaritas for you to take with you." I took care of this and my two regular customers telling Sandy of their drinking patterns and to take good care of them for me. I announced that the El Fuerte Bridge was coming up and the whole car followed me out for the crossing. This is the first time out there for most of them and they were loving it. 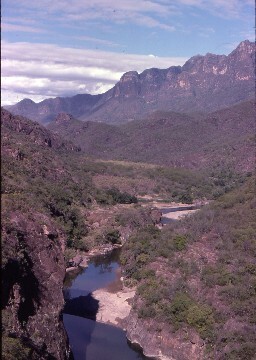 We crossed the El Fuerte River with Sandy and I looking down. It was sure peaceful looking today, quite nothing like that monster which was destroying things back in December. It is hard to imagine the last time I saw it the last time I was here but we did live through that whole adventure and are back to tell about it. The train that had run ahead of us that morning had been stuck for a week, so looking back we were really lucky. I returned to the lounge to prepare the cooler I was taking outside and my regulars were ready for their next rounds. I fixed theirs and prepared one of my own and enjoyed a few minutes of peace and quiet before going outside. The view from the desk is not so bad and far better than the view any Amtrak LSA gets on their jobs. We entered the El Descanso Tunnel and I headed out the rear door into the open car. When the train busted back out into the daylight I was open for service. I started by saying, "I am open and serving if anyone needs anything cold to drink. I am right here for you!" And did they come as I went through all of the Tecate and soft drinks so when the rush was over and after enjoying the Chinipas Bridge I went back inside to restock much to Sandy's surprise. I returned to the fresh air fully restocked and ready to go again. The pace was much slower allowing me to look out at the canyon and to point things out to my two regulars who had come out to join me. The Rio Serpentine had cut several new channels along its course probably from that storm this last December. It was a beautiful warm day with the sun really intense so one of the passengers gave me some sunscreen to use which was rated at thirty to help protect my face. Thank God I always wear one of my MacArthur baseball hats. Sandy came out to ask if I would give the talk at Temoris and I told her I would be honored to do so. This will be probably the only trip that I would not have my camera with me going through Temoris but I considered this to be a blessing to experience it eastbound at least this one time without having to look through the lens of a camera. We pulled into Temoris crossing the curved Santa Barbara Bridge around the first 180 degree turn before coming to a stop at the Temoris station. It was here with several video cameras trained on me that I went into my historical speech on the Chihuahua Pacifico Railway of its history and building. My timing was perfect as just when the train started to move I had finished to a round of applause. As we climbed the middle level passengers were telling me how much they enjoyed my lecture and thanked me for giving it. We entered the Le Pera Tunnel curved around the 180 degree turn putting us onto the top level with the outstanding view of Temoris below. We passed through the next tunnel that went between the monuments then entered the tunnel after tunnel section of the trip. I made on last call for outdoor bar service and my passengers cleaned me out. I would say my outdoor vending was most successful. I returned out from the sun with an empty ice cooler back to the lounge car finding my two regulars waiting for me for another round. I served them and Bill joined me for the first time today and we talked railroading. He asked, "How do you like working here?" and I responded with, "I like it very much!" It seemed that two of the cars were giving him a mechanical headache and just wanted to talk to someone who would understand. Lunch was served and I eat mine at my desk. It was the delicious chicken from the lady in San Blas and I enjoyed it with a drink from my private stock. I was busy again passing out drinks with lunch making more Margaritas and answering questions like. "What is the next scenic highlight of the trip?" Now that is on open ended question if there ever was one. It all depended on what a passenger likes and interests were. For me it is the entire railroad, rails, ties, grades, bridges and tunnels. For someone else it might be one special view or a tree or place along the line. Like I said it could be anything, so I picked something coming up and easy, "Go out into the open car and enjoy the next horseshoe curve as we gain a lot of elevation there!" They all left to go out and enjoy it leaving me to the peace and quiet sounds of the train climbing the grade. I found it interesting to be seeing the line from this view because I really cannot see up or ahead just out the side of the car. For the first time I was noticing the rocks in the cuts and paying attention to the trees along the line. 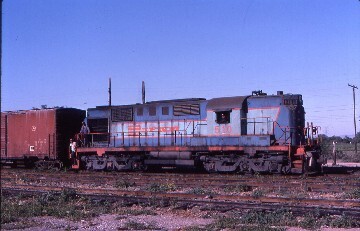 The train went into the siding at Irigoyen with Bill outside on the ground adding freon to refill the cars air conditioning units to help solve their problems. CHP 4 came by after twenty minutes and once we were on the move again it was time for another round for the regulars. The conversations continued as the train crossed the next high bridges including the La Laja Bridge before we arrived at San Rafael. We changed crews here but stopped longer than normal waiting for CHP 8 to come into town to get by us and as soon as he was cleared, we headed for Divisidero. The open car passengers returned looking hot and sweaty requesting "Chris' World Famous Margarita." I asked, "How do you know I make such a thing?" The said, "As good as you are we only would expect the best from you!" I started to prepare them and put some salt on the rim of their glasses for them before I pour. They each took a sip of theirs, smiled and said, "Perfect!" More satisfied customers. Boy this is fun! Another round for the regulars and the train arrived at Divisidero where I detrained most interested in the view but I did buy a small basket for my mother. She is into making miniature room settings so these little Tarahumara hand woven baskets are perfect so I found some buying her a few. Everyone reboarded and it was more Margaritas for our happy passengers who were very thirsty and were obvious having a very nice trip. I stayed busy but got everyone outside for the Rock of Fertility, We returned inside where everyone got served another before I announced El Lazo so we all headed outside. We rounded the three hundred and sixty degree loop of El Lazo and with that my regulars wanted more. I announced that, "We will be in Creel in about thirty minutes so now would be a good time to go to your room and gather up anything you need for your overnight stay in Creel." People took me up on my suggestion then returned ten minutes later wanting more Margaritas. Maybe my Margaritas are really that good after all. We have passed the highest point on the railroad so it was all downhill to Creel from there. We arrived at Creel with all our passengers detraining before our cars we cut off and put into the siding. After getting my hotel room at the Parador Montana, I took a very nice hot shower before Bill, Sandy and I went to have dinner. I had a Margarita with my steak and must admit that the ones that I make taste far better than the ones this restaurant served. I returned to my room, pulled out my half pint of Kessler and 7 UP to have a few nightcaps before I went to bed. 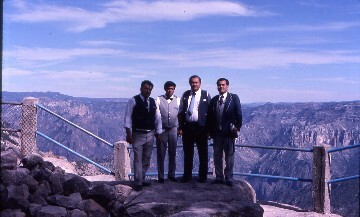 3/27/1991 The next morning it was hot cakes and bacon for breakfast before we did the Tarahumara Indian Cave Tour, Mushroom Rocks and Mission things before returning to Creel to spend a leisurely few hours before returning to the train to prepare the lounge for our passengers return. 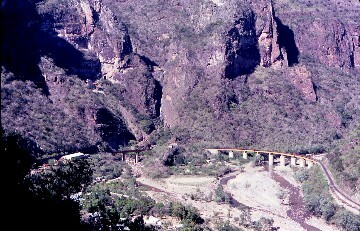 Our cars were picked up and put behind those of the Sierra Madre Express, the high price service to the Copper Canyon by rail. My regulars have returned and would like their usual. Some things never change. We were heading back west climbing up the CHP mainline towards the highest point on the railroad. Both kinds of Margaritas were flowing and I did a steady business by the time we reached the summit and I announced El Lazo in five minutes. 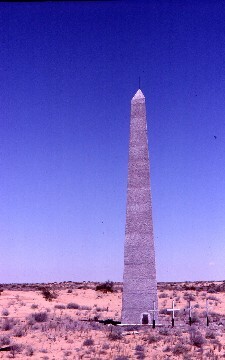 We descended down the loop and the passengers returned for another round when I announced the "Rock of Fertility" in two minutes on the left side of the train. The car cleared out until we stopped at Divisidero and I went for another walk around. Returning to my position my regulars were waiting for me so I fixed another round just as the train started to move. The Margarita crowd came around for some more of the regular version. I handled these people with the occasional glance out of my window to view the countryside. San Rafael came but this time I remained at my post as several of the passengers had yet to be served. Some of these people were first timers to my service. This kept me busy for the entire station stop. The late afternoon pace slowed down to nothing by the time the train crossed the La Laja Bridge so I sat back, fixed myself a drink and looked out at the canyon. I served no one from La Laja to Irigoyen before the Margarita crowd returned for some more of my special brew. Since we have far more daylight in late March than in December, dinner would be after Temoris, Sandy informed me. She then said, "If you want to go out and ride down through Temoris just do me one favor before you leave, make me a pitcher of your Margarita as I have heard nothing but good things about them!" I then mixed another batch poured Sandy and I each one before we drank a toast to another great trip. I headed out into the open car for an hour of riding in the fresh air out in the open on the CHP down through Temoris. In the late afternoon light the trip down through Temoris was incredible. After leaving Temoris and the crossing of the Rio Serpentine I returned to the lounge finding my two regulars wanting another round. Mr Rum and Coke leaned over and said, "Yours are so much better than Sandy makes!" I said, "That is because I make them like I drink them." He replied, "I wished everyone would make them like you did. If they did the world would be a better place!" We both had a good laugh at that one. Dinner was being prepared so the eager beavers came in for some pre dining refreshments. The car filled up with everyone just having conversations until dinner was served and I made drinks for all of them. Sandy gave me more of the chicken and I told her I was going to eat out in the open car and enjoy the crossing of the Chinipas River Bridge. I had the open car all to myself and for a few minutes I was enjoying nothing but the train riding experience. Following the Chinipas River, I went back inside to my duty of making after dinner drinks. 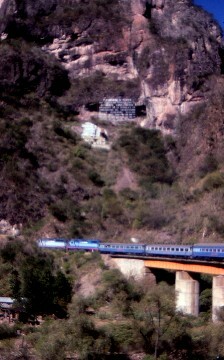 Everyone was happy and in a relaxed mood as the train traveled through the El Descanso Tunnel and exited into the foothills. The sun was setting but I suggested to everyone to go out into the open car for the crossing of the El Fuerte River in the twilight. I bought up the rear of the group and we all went out into the open car one last time today. Looking back to where we had been, it was hard to imagine that another day of CHP train riding was coming to an end. We crossed the river and all returned to the lounge car. Returning to my post, my regulars were waiting for me to do my duty for them and myself. I always look out for number one! We stopped at Loreto in the dark so the rest of this part of the trip will be under the stars. The pace of serving slowed down to finally one by El Fuerte so I took a five minute break to go out into the open car for a little star gazing which I love to do at any opportunity. You can see many more stars down here because the sky is darker due to the lack of city lights. After my fill of the Milky Way, I returned to my post and had a quiet trip the rest of the way to Sufragio serving my two regulars at a regular pace with a few others in between. We arrived at Sufragio and a yard engine coupled onto us and pulled us through the interchange tracks before spotting us for a westbound pickup. I straighten up the car and bar area, said my good nights to Bill and Sandy as well as the few passengers still left before I went to my room for a few nightcaps. 3/28/1991 The next morning, I awoke and then headed to the lounge car for my last day of service. I sat back and relaxed for a few minutes as the train rolled down the Pacifico's mainline. Bill strolled in, looked out the window and said we should be in Empalme in twenty minutes. I went to get some hot water for coffee, returning in time to serve two passengers who had just walked into the car so early in the morning. When we hit the yard limits, I went to my room to get my camera so I could detrain to get some pictures. I walked up to the front end of the train and saw a FCP employee doing his best Ozzy Osbourne wide arm peace sign stand. I took a picture of that before we both burst up laughing. I photographed the FCP engines on a side track north of the station before returning to the lounge car to pour more hot water for coffee. Bob sat down and ordered what else but a beer. We left Empalme and rolled past the shops where I shot a few more pictures before the train curved away from the Gulf of California and headed for the desert. The train passengers slowly woke up and filtered in for their breakfast, coffee other assorted items, so for the next hour I was busy with customers but I enjoy myself looking out at the Sonora Desert. Bob asked for another which I happily gave him Bob then leaned over and quietly asked, "Do you think I am an alcoholic?" I asked him, "What makes you think so?" He said, "I have been sitting for the last three days across from you drinking by myself." I said, "You have not been drinking by yourself!" as I smiled and reached into my bottom drawer and pulled out my gallon supply of Kessler. I have been drinking right along with you the whole trip, You just did not notice!" Bob ,now smiling said, "Thanks, Chris I needed to hear that." I asked, "Do you drink like this at home?" "No!" Then what is the problem!" as Bob returned to sipping his beer. There is a small town along the Pacifico on this section of track with ranch lands in between them. I was serving but as this is the last day of the trip people always tend to sleep late as I had on my previous trips. We came along a huge reservoir then crossed a spillway of a dam. 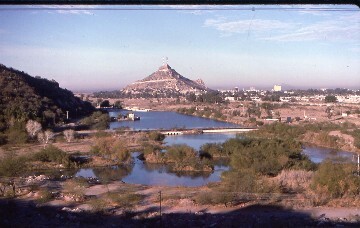 The water body is called Lake Hermosillo and is the water supply for the capitol city of Sonora, Hermosillo, our next stop. I detrained to stretch my legs and to photograph our train as well as the switch engines at the station. The station building looks more like an office building than any other train station in Mexico or anyplace else for that matter. We left town heading north out into the desert with the lounge car being very quiet, too quiet. I put my ABBA in Spanish tape in the tape player at a very nice low volume and leaned back into my chair relaxing. The places came and went without slowing. We passed through Zamora, Pesquira and Selva before we slowed to meet a freight train at Carbo. During the delay, my other regulars showed up so I served both of them again adding one Tecate and a mixed drink to both of their tabs. The switch was thrown by the freight train's rear brakeman so we were off again on our dash down the FCP mainline. We passed through Poza, Canou and Querobadi before we came to our next stop of Benjamin Hill where the train was split into two sections, ours going back to Mexicali while the other goes to Nogales. I detrained at Benjamin Hill to take some pictures and when I saw the vendors they became this morning's subjects. I watched them sell through the open windows and at vestibule. I have seen them before but I never really paid any attention to their practices. They know who will buy and who will not. It is interesting watching each individual's techniques and after watching them for a few minutes you can tell who is really good and who is not. I am in a country that does not run a dining car service so this is the system that has to work to feed people on their trips. 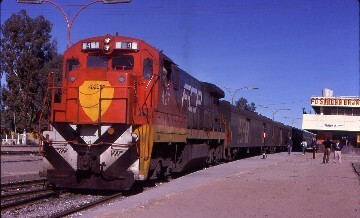 Our train was connected with another coach and engine preparing to leave town so I re boarded the lounge car and we were off on the final leg of our trip to Mexicali leaving the Sierra Madre Express cars to head to Nogales without us. The train was now back on the rails of the Sonora Baja California Railroad and we got quickly up to track speed as we went northwest out into the Altar Desert. A few passengers now came up expecting me to make some very exotic drinks. Sandy heard this and decided I needed a tip glass. I told them, "Tell me how it is made and I will make it!" I made a White Russian and two I had never heard of before, a Black Wizard and a Sunset Surprise. Now that was a funny name for a drink to be made before noon but the customer is always right. They sip theirs, they love it and start filling up my tip jar. There is fifteen dollars in it. Do I love big tippers! The Margarita Club arrived and as I handed them their drinks they increased my tip jar. My two regulars each wanted another round then added large amounts to my total. With everyone served and happy I poured myself another as the train stopped at Caborca. The train left Caborca, heading further out into the Altar Desert on this beautiful warm clear day. People came and went between here and Puerto Penasco but with each customer my tip jar was getting fuller. I had a request for more Blue Margarita so I mixed my brew and poured for more happy customers. I got a chance to look out into the desert which always surprises me of the things you can see by just looking. Just look for something then look for something out of the ordinary. It is a game you can play anyplace but I like the desert the best because nothing is hidden. After making a few more drinks for the passengers, the train pulled into the siding at El Sahuaro to wait for SBC Train 2 to pass us. Another round for the regulars and the Margarita Club before the train arrived in Puerto Penasco, our final servicing stop and leg stretching for the trip. Leaving Puerto Penasco, I closed up my window in a vain attempt to keep the sands of the Altar out of the car. Sandy came and collected my tally sheets so she can have everyone pay their bill and told me from here to Mexicali everything is free. As the train crossed the Altar I was busy making and giving out drinks as my tip jar grew and grew. As people had paid Sandy, they then came to see me for my services and information before handing me US Funds saying, "Thank you for everything, you are fantastic!" The sun set in the western Altar and our happy train headed for Mexicali through the night. We stopped at Coahuila with a real party going on in the lounge car. As we crossed the Colorado River back into Baja California Norte. We passed their Geo thermal fields all lit up and at Pascaulitos I announced, "Mexicali, fifteen minutes!" Everyone said goodbye to me before heading to their rooms to pack up. Sandy and Bill came by to thank me for doing such an outstanding and above board job. I told them I would be glad to help you out anytime you need my help. Sandy handed me a couple of twenties so I opened up my wallet, putting in that along with my tips before I cleaned up the bar area. Sandy told me that we would get everyone into taxi groups with those going to AA Parking or the Hotel Lucerna. The train went around the balloon track before backing into the Mexicali Train Station with my car leading so I returned to my room to quickly pack up. I lead the way off of the train, through the station and out front and I said "AA Parking" four other people joined me and Sandy came back from getting us a taxi saying, "Chris, you are all set. Take great care of yourself and I will see you in the future." We hugged before I was the last one inside the Taxi Cab. We drove across the border with little questioning and arrived at AA Parking. I got in my Chevy and drove to El Centro to get a hotel room since it was very late. 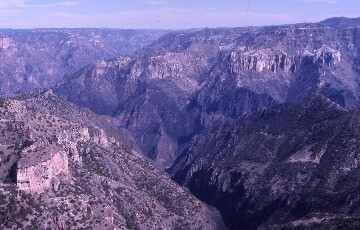 The next morning to drove home via the Salton Sea east side to Santa Ana ending another exciting but different Bananafish Tour Copper Canyon Adventure. You might be wondering how much I made in tips? Enough so I did not have to pay to get my car out of AA Parking or pay for the hotel in El Centro or pay for any of the gasoline on the trip home. I was left with $187.50 when I returned home. Not a bad job of bar tending even if I do not say so myself.